This email was sent to individuals who accessed the legacy MyUW portal during Autumn quarter 2017. It is time to switch to our new, modern, and responsive MyUW portal, which has been available to students since fall 2015, and to faculty and staff since July 2017. 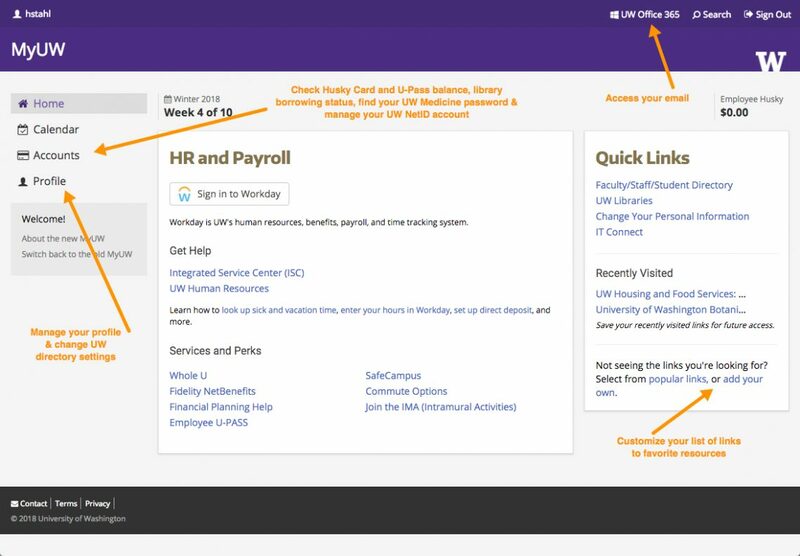 The new MyUW provides more personal, timely, and relevant content matched to your affiliation with the University, reduces information overload, and provides easy access to key links, tools, and information. Important: Your data, information and password will not change. You will need to migrate any bookmarks (see below for more information). Please make the transition before June 14, 2018, when the legacy MyUW will no longer be available. To ease this transition, the two portals (new and legacy MyUW) will be operated in parallel until June 13, so that you can make the switch when convenient for you. We know that changing the technology tools you rely on can be inconvenient, but we ask you to make the time to switch to the new MyUW as soon as possible. Save any bookmarks or custom links you created on the legacy MyUW. Your bookmarks won’t migrate automatically. If you have just a few bookmarks, try using the new Quick Links feature. If you have more than a few bookmarks, we suggest you review recommendations for managing your bookmarks. Click “Switch to the new MyUW” in the banner message posted at the top of the legacy portal page or click this link to automatically switch to the new MyUW: http://my.uw.edu/choose/new. After switching to the new MyUW, take some time to explore where to find important links and information. Click the image below for more details. April 10, 2018: If you are still using the legacy MyUW, you will automatically be directed to the new MyUW upon sign in. You can choose to switch back and continue using legacy MyUW until June 13. May 2018: You will receive a second reminder message to switch to the new MyUW. June 14, 2018: All users will be directed to the new MyUW, and the legacy MyUW will become unavailable. IMPORTANT: You will no longer be able to access bookmarks on the legacy portal. Learn more about the switch to the new MyUW. View help resources and video tours on IT Connect. If you need help, please contact the UW Information Technology Service Center at help@uw.edu or call 206-221-5000. The Service Center is available 24×7 to assist you. Thank you for making this switch to the new MyUW.